Sony Xperia XZ1 Ultra (Sony G8541) Large Screen Flagship Appears on GFXBench - Playfuldroid! 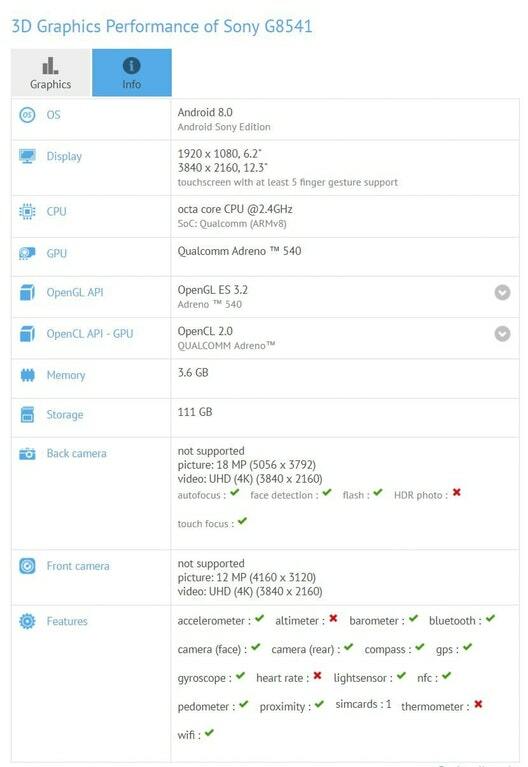 A new Sony smartphone with flagship specs have appeared on GFXBench benchmarking site. The new Sony phone is labelled is as Sony G8541 on the GFXBench. Speculations have it that the G8541 could be the Sony Xperia XZ1 Ultra that will be arriving as a successor for the Xperia Z Ultra from 2013. The smartphone features a 6.2-inch display that offers a full HD resolution of 1,920 x 1,080 pixels. It is also mentioned in another screen size of 12.3 inches that supports a 4K resolution of 3,840 x 2,160 pixels. It appears that the Sony G8541 would be available in phablet and tablet editions. It features Adreno 40 graphics which indicates that the Snapdragon 835 chipset will be powering the Sony G841. The SoC is accompanied by 4 GB of RAM and internal storage of 128 GB. The device is running on Android 8.0 Oreo and will carry support for NFC connectivity. It includes a 19-megapixel rear camera which suggests that it may arrive with Sony IMX400 sensor that can capture 960 fps slow motion videos. The frontside features a 12-megapixel selfie snapper. Other rumors hint that it would be sporting a IP68 certified chassis. There is a possibility that Sony may announce it alongside the Sony Xperia XZ1 and Xperia XZ1 Compact on Sept. 1 through the IFA 2017 tech trade show.